Filler posting. It's been awhile, long while. Cross bikes are a no go for Interbike Outdoor Demo but the Mono-Qs are still on. 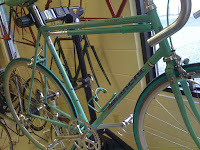 Bianchi 80s love from On the Rivet in Cambridge, MD. 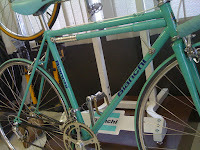 See Bob if you want to buy a restored to period Bianchi or need one restored. The guy does amazing work! Campy stamps the year on the bits, Bob gets it all together for a fee that is well worth it. Another find from the mind of Bob Beletsky. He will also do a custom leather seat bag. Check him out at On the Rivet in Cambridge, MD.